Pilchard fish cakes are rich in omega 3 fatty acids; brain and joint food. Perhaps you live within reach of a bounties of the seas market, as we were in Rotterdam for many years; or, more likely, you are now far distant from the ocean, as we are in our retirement, and omega 3 foods are hard to come by. Without omega 3 in your diet, you are going to be achy with inflamed joints, muscles and blood vessels; and organs too, making plenty of work for the chiropractor and cardiovascular surgeon. In Rotterdam we could regularly get fresh salmon from the fiords of Norway and Scotland, or herring and mackerel in the North Sea; but here, one hundred kilometres inland from the warm Mozambique current, there's a dearth of cold water sources of omega 3. In fact, of any fish at all. Enter canned pilchards from the cold Benguela current that wells up from Antartica, passing up the west coast of South Africa. The only problem is that many folk don't like them; and so fish cakes. That Leifheit can opener is the Rolls Royce by the way. 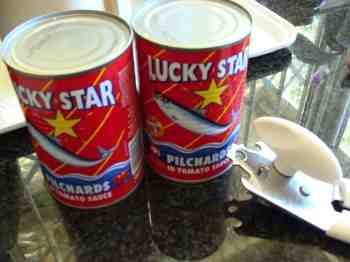 These cans of Lucky Star pilchards are inexpensive at about $1.50 apiece. I'm sure you can purchase something similar wherever you live. Pilchard fish cakes are a lot more palatable and very easy to bake; slow food made fast. Omega-3 is an important adjunct to the chiropractic adjustment. These pilchard fish cakes are a dream to make and fit in with our philosophy of slow food made fast; about fifteen minutes of actual work, and one hour from start to finish. This makes enough for half a dozen large fish cakes. 1 one pound can of pilchards in tomato sauce, with chili if you like it hot. Your favourite herbs and fish spice; coriander, for example. You are going to bake these in the oven so, seeing it's already hot, this is a good moment to make a roast vegetable dish; whatever's in season. We used butternut, eggplant, zucchini, mushrooms, green peppers and garlic tonight. It also keeps the fish nice and moist. As you may know, I'm into a greener planet, and that means using less energy. If you are going to heat the oven, then cook something else too. Either boil, or pressure cook your potatoes. Ten minutes. Drain the pilchards, pouring the tomato sauce into a small pot; preferably one with a steel base if you're going to use an induction cooktop stove; they use less than half the energy and cook faster than gas; instant heat. Finely chop the onion; you could first lightly fry them in butter or olive oil, but we don't. 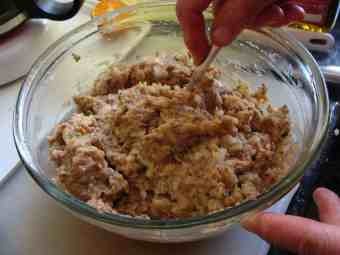 Mash up the pilchards, potato, onion and the two beaten eggs; and a teaspoon of fish spices. Form into fairly large fish cakes. 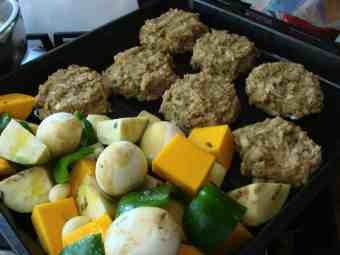 Onto half the oven dish pile your chopped vegetables; onto the other, spoon large dollops of the pilchard fish cakes mix. Pop the oven dish into a preheated oven at 200 degrees C for thirty minutes. Into the pot toss some fresh, finely chopped herbs to the tomato sauce; we like parsley, sweet basil, coriander and tarragon. You add your favourites, or whatever you have in your garden. Simmer for five minutes and then stir in a teaspoon of parmesan cheese; we often use feta. Oops, I took the photo before adding the tomato sauce, herbs and Parmesan sauce; something for next week. I'll make sure there's also some green beans or broccoli as well. Eet smakelijk, we would say in Holland; enjoy. Omega 3 intake in the diet needs to be high, but the omega-6 lower; so increase your cold water fish like pilchard fish cakes, and reduce the seed oils by changing to olive oil. Having said that, there's a huge amount of research going on about the fats in the diet, and a lot of conflicting views. For example, there's some evidence that reducing saturated fats in favour of polyunsaturates my help with MS, but it's not conclusive. There does seem to be general agreement that the ratio of omega-6/omega-3 should be kept lower; that means in particular increasing the fatty fish and freshly ground flaxseed in the diet. Good health care is about prevention as well as treatment; in the chiropractic world that means more exercise, and a healthy diet. If your omega 6 to 3 ratio is high, no matter how good your doctor, you'll have inflammation and anger in your joints and muscles. From animal sources, that means boosting your omega 3 with fatty salmon or these pilchards; add to that freshly ground flax seed and walnuts and you're home and dry. Research shows you'll have a healthier prostate in the family too, by the way. Go from Pilchard Fish Cakes to fish oil home page. What are omega 3 fatty acids 3? Would you like to start your own herb garden? Coriander and sweet basil grow like weeds; they also have anti inflammatory properties. They add flavour and for some make your pilchard fish cakes a lot more palatable. Healthy living tips are about prevention; it's a load better than a cure. 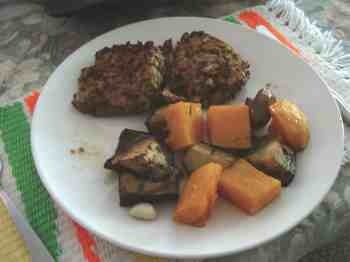 Pilchard fish cakes are one way to get plenty of anti inflammatory omega 3. With diabetes and obesity soaring in the Western world, and in South Africa too, despite access to wonderful food and excellent health care, we are slipping badly on the list of the world's healthiest nations. That means pain and disability, and a lot of lives cut short. Foods like our pilchard fish cakes are part of the solution, but in short it means returning to those foods that your grandmother once served. Overly busy mothers have often succumbed to the temptations of the fast food industry, frozen pizza and the like, with disastrous consequences for our health. Where to start, is often the question? I would recommend this quick hummus recipe; you can make it in five minutes with a little practice; enjoy it every day with a salad and you'll find your health status improving in leaps and bounds.